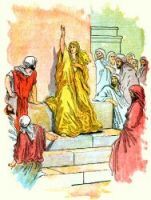 Deborah, the "mother of Israel," is the most prominent woman in the Old Testament She was Israel's one female "judge" and a chief prophetess, ever faithful and devoted to her people. For twenty years she watched in silence, as the Canaanites oppressed the children of Israel. Then divine inspiration came to her. She sent word to Barak, a chief of the northern tribe of Naphtali, that deliverance was at hand. At her summons Barak marched southward with a thousand men of Naphtali and Zebulun. 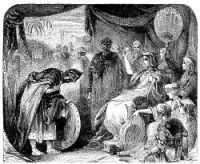 The terrible general of Jabin, Sisera, gathered a tremendous army to fight against Barak. 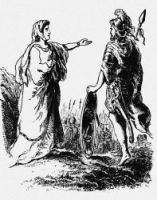 Barak hesitated to attack the enemy, and only agreed to fight if Deborah accompanied him, which she did. Inspired by her presence, the Israelites met Sisera by the banks of the Kishon river and completed destroyed his army. This set of Deborah Bible illustrations are from my collection of antique Bible books. Feel free to use these Deborah Bible pictures in your artistic projects. Click on the Deborah Bible illustrations below to see more details about saving a free Deborah Bible image or about purchasing the Deborah Bible images at a higher resolution.